A wonderful Middle Eastern side. Place the yogurt in a cheese cloth or dish towel. Gather all sides and squeeze some of the water out of the yogurt into the sink. (Cucumber releases water into the yogurt). Place yogurt in a bowl. Add cucumber, onion (optional), dill, mint and salt to taste. Note: great with kabobs or by itself. Better if refrigerated for at least 30 minutes. If you opt for fresh herbs then it's fine served right away. 204 members have added this recipe to their cookbook. You can have this with kebebs its an iranian side dish. substitute fat free yogurt and you have a great side or dressing for a salad in the Cruise Phase. Quick smoothie recipe for breakfast. You can add chocolate chips or other toppings like nuts, blueberries, etc. 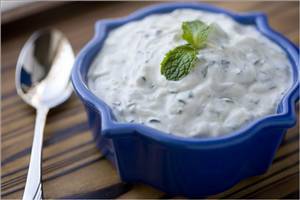 There are 178 calories in 1 serving of Cool Cucumber and Yogurt Salad. Calorie break-down: 20% fat, 49% carbs, 31% protein.